When an impact driver is just not enough power for you, now you can get it done with one of the new Bosch Impact Wrenches. Their new 18V lithium-ion impact wrenches weigh in at 6.7 lbs. and offer 500 foot-pounds of torque, with a total head length of 10-inches. Bosch is offering the new wrench with three different chuck choices. The IWTH180-01 uses a 1/2-inch friction ring for quick and easy socket changes, the HTH181-01 uses a 1/2-inch detent-pin for positive accessory retention and the HTH182-01 uses a 7/16-inch quick change for tool-less accessory removal and works with common 7/16-inch hex accessories. The wrenches feature a magnesium front to protect the tool during toughest of working conditions, and an all metal gear train drives the motor at 1,900 RPM. The impact and anvil system provides the wrenches with 2,100 impacts per minute. This make the tool perfect for applications such as driving large lag screws, performing assembly and repair, and removing and installing wheels. A new task Bosch discovered these wrenches are great at, is drilling with their new NailKiller auger bits. With the impact wrench these large bits can be used with only one hand. To put the new wrenches over the top, Bosch also threw in an LED light that activates when the trigger is slightly depressed. Each tool comes with two 18V lithium-ion FatPack batteries, a 30-minute charger, and a hard carrying case with socket storage. 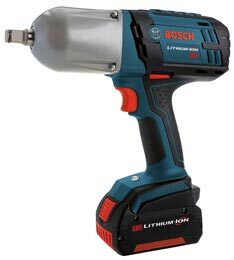 Because the wrenches use Bosch's Flexible Power System, they are also compatible with their 18V SlimPack batteries. All three models will be available later this fall through authorized retailers.